(TibetanReview.net, Nov18, 2016) – Despite imminence of detention, disappearance and torture by the Chinese police, two young Tibetan women had on Nov15 staged a peaceful protest on a street in Ngaba (Chinese: Aba) county-town of Karze (Ganzi) Prefecture, Sichuan Province, said Washington-based Tibet advocacy group International Campaign for Tibet Nov 16. 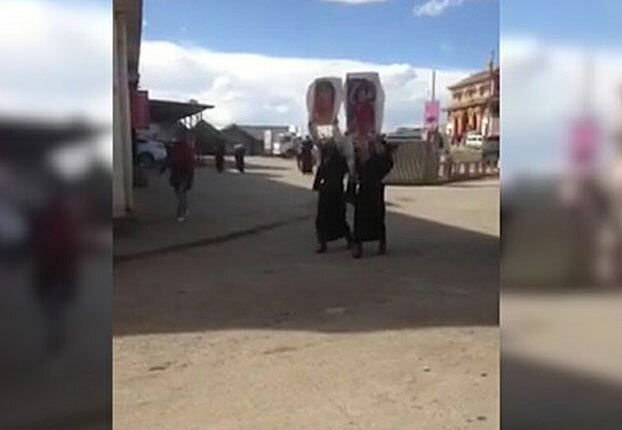 A video footage posted online shows two women in traditional Tibetan dresses walking down a street, each holding high with both their hands a portrait of Tibet’s exiled spiritual leader, the Dalai Lama. There is no further information yet about the incident, including the identity of the two women. There is also no information whether the two had been held, although that is seen as inevitable, given the strong presence of Chinese police in the protest-prone area and their intolerance of any form of dissent against Chinese rule. The area has seen a number of similar protests by lone Tibetans over the past couple of years or so, shouting demands for freedom for Tibetan people and seeking the return home of Tibet’s exile spiritual leader, the Dalai Lama. The Ngaba county-town has also seen the most number of self-immolations by Tibetans since 2009, including the first one, with the protesters raising similar demands and loudly praying long-life for the Dalai Lama.